Creating a fabulous party doesn’t have to mean breaking your budget. There are so many ways to create cute and simple backdrops for parties and the good news is that you likely already have a lot of the supplies at home! Here are some easy ideas along with the approximate cost of each and where you can find the supplies you need. Crepe Streamers: Crepe streamers come in many different colors so you’re sure to find one that fits into the theme of your party. At your local dollar store, you can buy a package of 2 rolls of crepe streamer paper for $1 or less. There is actually quite a bit on one roll so one package will go a long way when decorating your party. An easy way to create simple backdrops with crepe streamer paper is to simply cut off strips, stick it to the wall with painters tape (on the back of the paper so you can’t see the tape) and then slightly twist it at the bottom. It creates a cute swirl effect and it looks really pretty when you mix and match colors. You can see a sample in the first photo above. Wrapping Paper: Wrapping paper is such a quick and easy way to add some color to the walls of the party area. Simply use painters tape to attach wrapping paper to the wall behind the food table. Wrapping paper is available at your local dollar store and (depending on the size of the roll) 1-2 rolls will be enough to decorate the area behind your food table. For an example, the second picture above shows a red wrapping paper backdrop for a Chick Magnet birthday party theme. Homemade Banner: There are many easy ways to create a fun homemade banner with a little bit of construction paper, double-sided tape, scissors and ribbon. In the third picture above you can see how I used these supplies to make a LEGO banner for a recent party. Again, the dollar store is a great place to shop for all of these supplies. One package of construction paper can make many unique and simple backdrops. Sheets, Curtains or Plastic Tablecloth: If your food table at the party can be set in front of a window area, you can use the curtain rod to drape fun curtains, sheets or plastic tablecloths in the same color scheme as the party. You could even drape a second color for a more layered effect. All of these supplies can be stored and used for more simple backdrops in upcoming parties. Tissue Paper: With this easy to follow Tissue Pouf Ball tutorial, you can create cute tissue pouf balls to either hang in the party area or attach to the wall. You can find tissue paper at your local dollar store and one package of tissue paper could make 8 medium sized tissue balls. See the first picture in the second row for a sample. Printable DIY Party Supplies: I first discovered Etsy.com last year and I’m hooked! There are so many fabulous party companies that make cute printable party supplies. Did you know that can can request a simple 1-page design and then email it to your local print store to enlarge into a poster size? The second photo in the second row above is a sample of a pilot one I had enlarged at my local print store and the cost was under $4! These simple backdrops are something that you could have customized and they would be completely unique to your party. Twinkle Lights: A twinkle light background is probably one of my favorite ideas for a party background. It always looks so pretty at weddings so why not try a smaller version for a birthday party? A good time to find inexpensive twinkle lights would be just after Christmas at your local department store. Plastic Vines: I love this idea for a monkey, jungle or safari party – hang plastic vines in the party area and attach small stuffed (or paper cutout) animals to it. You can buy a large bundle of plastic vines at your local dollar store for $1. For a sample from a monkey party I created, see the last picture on the second row. Fabric Strips: Something that I haven’t tried myself but I’ve noticed in other parties is strips of different fabric hung like ribbon on a banner. The fabric strips hang lengthwise down in a row and create a soft background in a party area. Helium Balloons with Ribbons: Helium balloons and ribbons make really simple backdrops for parties. All you’ll need for this are some helium balloons and some gift wrap ribbon. The ribbon designed for gift wrap is perfect because with a pair of scissors you can curl (spiral) the ribbon simply by running one side of the scissors quickly down the ribbon. Cut the ribbon pieces long so that they hang down to the party area. Most dollar stores or party stores offer helium for balloons. See the first picture in the last row above for a sample. Paper Lanterns: I was surprised to find paper lanterns in all different sizes and colors at our local dollar store. These are inexpensive party supplies that can be used over and over again for simple backdrops. The first picture in the last row also gives a sample of pink paper lanterns used in a princess-themed party. Photo Banners: A popular trend in first birthday parties is to create a photo banner from your child’s first year. With all the pictures from birth to 12 months old lined up in a row, it’s amazing to see how much your little one has grown! You can easily create your own photo banner with construction paper, double-sided tape (use the permanent kind so the photos don’t come loose), scissors and ribbon. Photo banners aren’t just for first birthday parties. They make simple backdrops for many special occasions like a graduation party, retirement or baby shower (baby bump photos!). 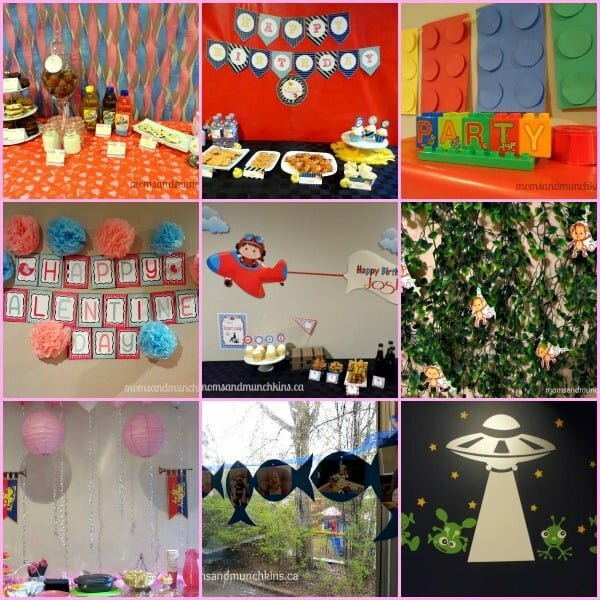 The second picture in the last row above shows a sample of a fish photo banner I made for my son’s first birthday party. Wall Decals: Wall decals are a cute and easy way to decorate your party area. You can find some wall decals at your local dollar store or you can order more customized ones through one of the many companies on Etsy.com that create them. See the last photo above for a sample of the alien decals we have in my son’s playroom. What are your favorite ideas for simple backdrops? Have you tried something that looked fabulous? Feel free to share your ideas for simple backdrops in the comments below – we’d love to hear about them! We’re constantly adding new ideas for parties and we want to share them with you! Follow along on Facebook, Twitter, Pinterest and Bloglovin’. Thanks for the great post I’m going to use some of these for their next party! Thank you for sharing. We area always looking for new party ideas and decor. Great suggestions. I think paper lanterns are in order for my next party! The Lego one is my favorite! My boyfriend is a LEGO nut so this would be perfect for him!